Daryl Mitchell was New Zealand's best bowler and returned with figures of 2/27 in the series decider versus India in Hamilton. 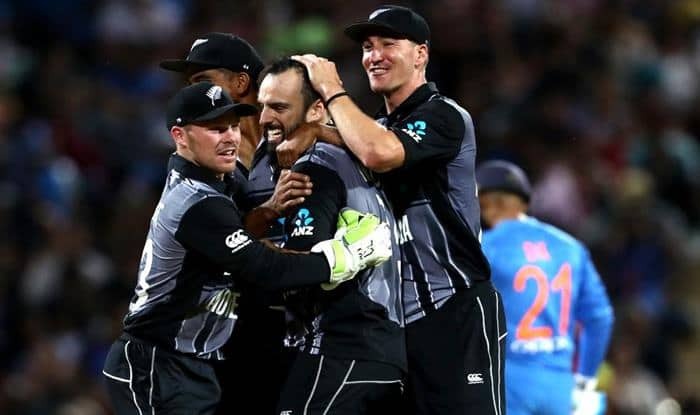 Exploiting batting-friendly conditions at the small Seddon Park ground, New Zealand cut the Indian attack to shreds to post an imposing 212 for four. Opener Colin Munro produced a 40-ball 72 and shared an 80-run stand with fellow opener Tim Seifert (43) to lay the foundation for a big score. India captain Rohit, who usually bats explosive in such situations, made an uncharacteristic 32-ball 38 and it also hurt India’s chances. Vijay Shankar (43 off 28) played a useful knock though at the top after Shikhar Dhawan (5) fell early. Rishabh Pant (28 off 12) and Hardik Pandya (21 of 11) infused some life into India’s chase with some brutal hitting but perished while trying to keep up with a steep scoring rate. Mahendra Singh Dhoni (2 off 4) also could not do much. India needed 16 runs off the final over and Dinesh Karthik (33 not out off 16) after taking a double off the first ball, stunned the crowd and his teammates by refusing to take a single in the third ball. Krunal (26 not out off 30) had reached the striker’s end but Karthik did not run, sending his partner back. New Zealand bowlers fared much better than India, consistently hitting the short-of-length, which proved to be key on this small ground. The runs came at a steady rate with just an odd boundary coming in between. Seifert, who paddle swept both pacers and spinners with ease, lofted Hardik for a six over long-off. Indian bowlers had conceded 79 runs in first seven overs when Rohit brought Kuldeep and the leg-spinner straight away made an impact, by getting Seifert stumped with Dhoni’s lightning quick hands at work. Munro kept going strong as he hammered Krunal for a six to raise the team’s 100 in the 11th over. Again it was Kuldeep who came to team’s rescue by seeing the back of dangerous-looking Munro while Khaleel Ahmed got rid of Williamson (27).